Pre-heat oven to 350 degrees. Pick through crabmeat to ensure there are no shells. Mix together all ingredients for crab cake except crabmeat and saltines until base mix comes together. Using a rubber spatula, gently fold in crabmeat trying not to break up the lumps. Once crabmeat is mixed with the mayonnaise base, sprinkle in saltines and fold together. Allow mixture to rest in a refrigerator for about an hour until cold. 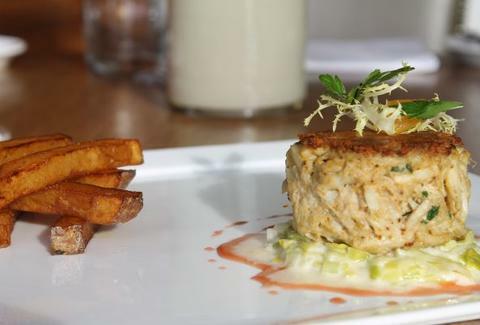 Using a 2-ounce ice cream scoop, scoop out crab cakes on to a parchment or silpat lined sheet tray. Place crab cakes in the oven and cook until golden brown on the outside but just warmed in the middle, about 10 minutes. Meanwhile make tartar sauce. Using a mixing bowl and rubber spatula, mix all tartar sauce ingredients together and set aside. Can be made a day ahead of time. Prepare a breading station by placing all-purpose flour in one bowl, whisked whole eggs in the second bowl and panko breadcrumbs in the third bowl. Roll 2 ounce crab cakes into balls, bread each cake by first dredging in the flour, followed by the egg wash and finally by the panko bread crumbs. Fry the crab cakes at 350 degrees until golden brown but just warmed in the middle, about 3 minutes.